“As to myself, no credit is due to me for discovering the existence of classes in modern society, nor yet the struggle between them. Long before me, bourgeois historians had described the historical development of this struggle of the classes, and bourgeois economists the economic anatomy of the classes. What I did that was new was to prove: 1. that the existence of the classes is only bound up with particular historical phases in the development of production; 2. that the class struggle necessarily leads to the dictatorship of the proletariat; 3. that this dictatorship itself only constitutes the transition to the abolition of all classes and to a classless society”. In Works , vol. 39. In this phase the centre of all our activity, its dead axle, is the propaganda of socialism: what socialism consists in (explaining it on the base of the first socialist countries’ experience and of the symptoms existing in our society, (1) that it is the anteroom, as much tormented as one wants but however the anteroom of socialism), why the mankind cannot do without socialism, why socialism is possible despite the strength and the opposition “at any cost” of the bourgeoisie and of the clergy, why the working class is the class that is able and that has to lead the rest of people’s masses to establish the socialism, what needs to be done for managing to establish socialism (the way to socialism in our country, our strategy to establish socialism). Our whole activity has to be permeated and set in the propaganda of socialism as unique solution, as necessary solution, as possible solution of the political, economic, social, intellectual, moral and environmental crisis produced by the capitalism. In imperialistic countries the propaganda of socialism is indissolubly associated with the struggle against the economism. It is impossible that we communists win the workers over to the struggle for establishing socialism if we are polluted by the economism. The economism is at the same time 1. the spontaneous conception of the proletarian who no longer resign himself to the maltreatment he is subjected, but who is still ideologically dominated by the bourgeoisie (he still has a mentality peculiar to the bourgeois society) and 2. the bourgeois (i.e. promoted by the bourgeoisie) policy for these workers. From that come its persistence and its reproducing in a thousand different forms, as a malignant illness that threatens and that where it obtains it debilitates the communist movement. The economism is the worker’s “spontaneous” conception. The worker educated by the bourgeois society, with the mentality (the spontaneous philosophy) he absorbs from the bourgeois society, with the mentality created and made natural by the merchant practice, of selling and buying, reaches the struggle of claims. The proletarian is a workforce seller, the owner wants to pay for it as little as possible, the proletarian tries to sell it at the higher possible price. So he finds the power of association as a means suited to this end. That is the trade union and in this it has originated and continually regenerates the trade-union struggle, the struggle of claims, as one call it, in and out the factory. The economism is the scope which the bourgeoisie tries to confine the worker in, when the civilization general conditions are such that it is impossible to prevent the struggle of the proletarian classes against owners and to forbid their association for this purpose. Back in Italy it has been the philosophy on which CISL [ Italian Confederation of Workers Trade Unions ], UIL [ Italian Federation of Trade Unions ], ACLI [ Italian Workers Christian Associations ] were born and have lived, the “yellow” (i.e. friends of the owners) trade unions and corporative ones: the worker has the right to improve and until he restricts himself to this his struggle is right. There are countries such as Germany where, by law and by contract, workers’ organizations are forbidden to deal with something else. In Anglo-Saxon countries (USA, Great Britain, Australia, etc.) for decades by now, within preventive counter-revolution regimes, (2) proletarians have carried out also tireless struggles of claims, organized by bourgeois trade unions or led by followers (sometimes very combative too) of economism, anyway, and the workers’ organizations don’t go beyond the wage and contractual claims. The struggles of claims are essential to the proletarian classes. The proletarians oppose with struggles of claims the owners that drive wages as down as possible, that try to squeeze as much as possible workmen in every field, the Authorities that extort taxes, impose restrictions and eliminate attainments. The proletarians use the power of their organization and of their number, they take advantage of the need the owner has of them as a class, of the consent and votes which the Authorities make use of, to demand better wages and working and general conditions. Up to that all we communists agree. Up to that there are disagreements with who support instead the consultation with owners, the compatibility, the workmen’s collaboration with the owners, the sacrifices policies, the resignation to the less badly. The divergence between we communists and the followers of economism begins from this point on. The followers of economism assert that sooner or later the workers through the struggles of claims reach the political struggle. What the political struggle consists in, here’s the first topic which many followers of economism are reticent or ambiguous about. A struggle against the government and the Authorities to induce them to make favourable or at least less iniquitous laws and rules, to allocate benefits, to build council houses, etc., or a struggle to take power and to establish the socialism? Italian followers of economism, those which honestly consider even themselves communist (those, to give concrete examples, which lead Proletari Comunisti (RossOperaio) [ Communist Proletarians ( WorkerRed )], Rete dei Comunisti, [ Communists’ Network ] , etc. which constitute varied gradations of economism followers) won’t tell you the political struggle restricts itself to the first thing in their opinion. But actually they talk to the workers only about the first thing, they leave in the background the issues of the strategy and the tactic for the seizure of power, they mix up trade union with party, organizations for the struggle of claims with organizations for the political struggle, the organizations they build are suitable only for the first type of political struggle. The leaders of Rete dei Comunisti [ Communists’ Network ] even explicitly say you that the function of political organization is to serve as a political bank (i.e. in the bourgeois institutions) for the workmen’s struggles of claims, it is to drive the bourgeois authorities to make laws and rules that are favourable to the workmen, it is to support the struggles of claims and the relevant organizations by the prestige and the authority of the state office. We communists surely support political struggles of claims too, all sorts of initiatives done in order to drive bourgeois Authorities to make laws and to lay down rules that are favourable to the people’s masses, to allocate public money for the people’s masses by benefits, public works, schools, health system, etc. and to reduce tax collections and similar ones (prescription charges, stamps, etc. ), to curb prices that eat into the wages and the employees’ salaries and that bleed self-employed workers dry. But we promote in the workmen the awareness the other classes of the people’s masses and them need to establish socialism and we urge them by all means to get organized in the form which is necessary to realize this objective. Obviously in the field of the struggle for the socialism there are different levels of awareness and different degrees of organization. We communists are one of them too and the communist Party intends to be the highest awareness level and the highest organization degree. That’s why it sets going a consequent policy of recruitment, of its own members’ training, of its own leaders’ selection, of its own ranks’ purge, it practises criticism-self criticism-transformation and struggle between two lines inside itself and it works according to the principle of the democratic centralism. It then asks the members of the Party for an awareness, a conduct, an effort, a care and a devotion to the cause which are quite exceptional also among the workers. All that is derived from the experience of the communist movement which goes on by now for 160 years and has achieved great successes, beyond comparison during human history, even if in the last decades of last century it has suffered reverses and defeats. The communists before them haven’t lost heart, they have looked for the reasons for these reverses and have corrected errors and overcome limits that had weakened the communist movement to such an extent that the bourgeoisie and the clergy, which were on the decline, have prevailed again. The renewal of communist movement progressing in the world and in our country as well, under the auspices of Marxism-Leninism-Maoism and following the strategy of the protracted revolutionary people’s war, confirm and will verify the effectiveness of the discoveries made and of the corrections introduced. How can one promote a suitable awareness in the workmen it needs to establish socialism, and how can one fitly organize them in order to reach that objective? The closest followers of economism to us communists, and we can mention Proletari Comunisti (RossOperaio) [ Communist Proletarians (WorkerRed) ] as an example, don’t deny this communists’ duty, but they assert the struggles of claims are the only or the principal way by means of which the workers reach to conceive they have to fight in order to seize power and to establish socialism. Do we want to bring workers to fight in order to establish socialism? Well, let’s promote struggles of claims, let’s organize them so as they carry out struggles of claims that are more and more excessive, more and more general, more and more combative (“militant”), having more and more ambitious objectives, and you will see that sooner or later the workers will reach enough to understand that they need finish with the owners and to take the power in hand. Because the State intervenes in a thousand ways in the struggles of claims in support of the owner: which is certainly true. Because in a large number of struggles of claims the State is itself directly the owner, it is involved as the principal antagonist. And really proletarians’ normative conditions and in some cases economic ones too come from the State policy. Which is certainly true and it’s all the more truer and important in the imperialistic countries where the economy is highly collective, where the bourgeoisie with the State are merged into the State monopolistic capitalism. It does to consider the speculation that is getting zoomed up price of fuels, of foodstuffs , of other consumer goods and of a large number of services, ruining the employees, the pensioners and a lot of self-employed workers. The conclusion the followers of economism draw is that who wants to establish socialism has then to promote and to foment struggles of claims. Workers understand the necessity of that, while they would make nothing of it if we talked to them about communism and socialism. Doing struggles of claims they will run into the State and will be compelled to realize that political struggle is essential. One mustn’t talk to the workers about communism and socialism. They would get frightened, they would grow apart from us, they would not even be listening to us. Let’s instead talk about wages, working conditions. These are “concrete” things: the workers can understand them because they directly experience them. If we organize successful claims, the workers will follow us and we will manage a little at a time to bring them to fight in order to establish socialism too. The thousand versions of economism that pollute the communist movement start by this point, they can in some periods and countries manage even to choke it off. In our country the state-controlled trade unions, particularly the CGIL [ Italian General Confederation of Labour ], and the grass-roots trade unions (the alternative ones) are full of communists that are supporters (promoters) of a sort of “Long March toward the communism by struggles of claims”. The FSRS [Forze Soggettive della Rivoluzione Socialista ( Socialist Revolution Subjective Forces )] are imbued with economism. Proletari Comunisti (RossOperaio) [ Communist Proletarians ( WorkerRed )] declares that “only trade-union struggle is concrete”. That to be a communist leader it has to be “a recognized trade-union leader”. Our ranks are not immune from it too. When a comrade arrives at a new workplace, it’s “natural”, it’s “unavoidable” he tries to organize some claim. If struggles of claims are not progressing, after all (although he repeat a thousand sentences of the Party showing the opposite) it seems to him there isn’t class struggle there, that “they all are backward”. When an organism has to decide upon what to do, the mind often races only to the struggles of claims which can be promoted. And there are always plenty of useful and necessary struggles of claims, both for workers and for the other classes of people’s masses, so many are the owners’ and Authorities’ misdoings. In this period still more than in the last years. Actually workers carry already out by themselves struggles of claims and it suites them if communists help them. Is this the central aspect of our function, yet? Is it true that struggles of claims spread and grow stronger, and sooner or later become political struggle in order to transform the social system? Experience shows really different things from those the followers of economism maintain. There are first of all the workmen of Anglo-Saxon countries, the most advanced capitalist countries in the world, and the workmen of other countries too, including ours, which have carried out and are carrying out tireless struggles of claims, but they haven’t managed and are still far from managing to realize that to resolve their troubles and to stop struggling in the same meshes, with ups and downs, taking today a step forward and tomorrow a step backward if not two, at the mercy of the initiative of owners, of speculators, of bankers, of clergy and of their governments, they have to establish socialism; and still more far from having built a suitable organization for the purpose. Where the communists don’t carry out a specific action to promote that awareness and to create that organization, struggles of claims don’t bring the workers either to the awareness or to the organization which we are writing of. There are instead several examples of countries and of historical periods in which communists carried out the propaganda and organization task which we are writing about, combining it with struggles of claims against owners, with political struggles against governments and Authorities in order to get reforms and with any other type of struggle for limited and immediate objectives, and using each of them as a communism school. Communists have several times managed there to create a vast movement of workers and members of other classes of the people’s masses having the suitable awareness and organization for fighting in order to establish socialism. Suffice it to think, back in Italy, about the Red Two-year period [1919-1920] and the Resistance with the directly following years, before the modern revisionists got the upper hand in the communist party and a little at a time, by a lot of effort, tact and astuteness, they turned it into a bourgeois left wing party (i.e. dealing with struggles of claims, but not with socialism, and defaming the communist movement). Suffice it to think about the October Revolution and the Soviet Union, the Chinese revolution and the People’s Republic, the many other socialist and new democracy revolutions the communists led during last century and those they still lead today. Let’s more carefully consider things now. Advanced and heavy as the demands we make to owners and the claims we put forward may be, combative as the struggles of claims we carry out may be, they still keep something qualitatively different from wanting to seize power, eliminating the owners and establishing socialism. They are two quite different matters. There is a jump between them. Movements concerning claims so differ from the struggle for socialism in the objective first of all. With the mentality (the philosophy) the development of merchant and capitalist economy creates in the people of bourgeois - and on the way to become such - countries, the workers have been able and have had to carry out struggles of claims. They’ve had to this end to join forces, to constitute themselves into trade unions, to collectively demand this one or that one from the proprietors and from Authorities. It’s what has happened in every country little by little it has become bourgeois. All modern countries’ history nevertheless shows as well that workers are more receptive to communist theory (to Marxism) than the other classes. It is easy to understand why. The workers constitute with the bourgeoisie one of the two classes of the big production, and modern society bases itself on the big production, on the collective productive forces, on the more and more extreme division of labour among production units and departments and on their combination. Communism in the modern, current sense of term, resumes and carries on the intellectual, moral and practical development brought into human history by the bourgeoisie, and it overcomes the contradictions that bourgeoisie, the last of the exploiting classes, cannot overcome, the contradictions (in economic, moral, intellectual, social, political, environmental matters) in which mankind is struggling nowadays and which bring its very survival into play. The workers are for their position able to understand all that more than any other class, in spite of the intellectual and moral condition which bourgeoisie holds them in, because the way which communists propose is as well their particular emancipation from the bourgeoisie that they in vain seek with struggles of claims, which they spontaneously reach too, with the spontaneity peculiar to a workman of the bourgeois society, obviously. But movements concerning claims and struggle for socialism do not differ only in the objective. Also the structure of an organization concerning claims, the relations which it is built on, the statutes which rule it are inevitably different from the structure of the communist parties which have as their central aim the struggle against the bourgeoisie and its State to take power and to establish the socialism. Just because the two types of organization have different objectives. The hallmarks of cadres and leaders, the aptitudes they are required to have and their training are different in the two types of organization, because dissimilar are the struggles they have to conduct, the situations they have to face, the tasks they have to carry out. The organization in order to establish socialism is built when and where there are not struggles of claims too, where struggles of claims cannot be there. Communists build party cells into hostile field as well: inside the armed forces, the police, the Carabinieri Corps, among the magistrates, the prison guards, the bourgeois State officials, everywhere. The communist who goes into an environment, doesn’t first of all and on all occasions look for what struggles of claims he can promote. He looks in that environment for who is most accessible by the communism ideals, most able to understand them and generous enough to embrace them and to join up with the struggle to assert them. But there is something else more. In most developed capitalist societies, in which capitalism has reached its highest development stage, the society is now planned in such a way, its economic structure is so collective that any claim of a part of the popular masses is prejudicial to the interests of another part or it is at least used by bourgeoisie as a pretext to prejudice the interests of another part or to get a political advantage from it (dividing and contrasting, subduing to itself, etc.). If workers of the factory X effectively oppose the close-down, owner shuts down the factory Y, maybe in another country, and he points out the workers of the factory X to the workers of the factory Y as responsible of their trouble. The pensioners wanting a decorous pension become the ruin of country’s economy. If road accidents decrease, car repair shops, car factories, surgeries and undertaker’s firms close down and gravediggers are dismissed. If people who smoke decrease, tobacco factory’s workers, tobacco growers and tobacconists are in trouble. The whole society is built this way. The struggle to establish socialism unites workmen and people’s masses who the struggles of claims within the scope of bourgeois society would set some against others. In periods of economic crisis, when the unemployment is rampant, it becomes harder carrying out struggles of claims. One often struggles, strikes, and gets a little or none. Tomorrow the inflation will eat into the rise you secure today. You compel the owner not to dismiss and the day after tomorrow he goes bankrupt or delocalizes. Struggle of claims seems meaningless. Just in these periods the struggle for socialism gives the struggles of claims too a sense, if they work as effective communism schools and bring workers and people’s masses that take part in the struggles of claims nearer to the struggle for establishing socialism, if they fortify their determination to fight, broaden their organization, urge the best of them to enlist in the communist party. Communist awareness and organization in turn infuse strength into the struggles of claims and develop solidarity among workmen and people’s masses of different firms, sectors and countries, united against owners, clergy and their governments, to establish the socialism. Finally, the watchword of economism followers before the economic struggles and the rest of the struggles of claims, both political ones (i.e. with the purpose to drive political Authorities of the hostile State to take certain steps) and the ones directed against single proprietors and others notables of the regime, is “politicize the economic struggle”. On the contrary, the communists’ watchword is “make economic struggle a communism school”. (4) The struggle to establish socialism is the necessary context in order to develop struggles of claims in large and with more immediate successes, besides answering the questions that capitalism, come to an advanced degree of development, puts about mankind’s future. 1. A big company is by now made up of dozens or hundreds departments, placed at times far apart. Each department is equipped and awarded with what is needed for it to do the working which is assigned to and it passes its product, having the established quality and quantity, to another department. It doesn’t sell nor buys, doesn’t exchange, doesn’t have merchant relations with other departments. What the hundreds departments of a major industry are today and the relations they have among them, the thousands of production units of a socialist country will do tomorrow, and the hundreds of thousands of production units of the whole world will do the day after tomorrow. M. Martinengo and E. Mensi, A Possible Future (2006), Ed. Rapporti Sociali [ Social Relations ]. 2. 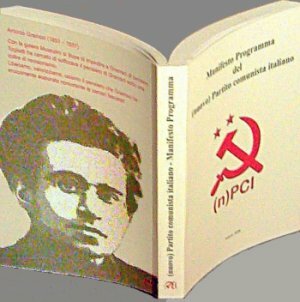 Apropos the nature and the history of preventive counter-revolution regime, see Manifesto Program of (new)Italian Communist Party , chap. 1.3.3. p. 46-56. 3. Lenin, What Is to Be Done? chap. 2a, in Complete Works , volume 5 p. 346. 4. The meaning of communism school is illustrated in Manifesto Program of (new)Italian Communist Party , note 30 p. 262.